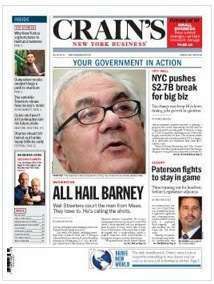 If you haven’t picked up a copy of Crain’s New York Business yet, see if you can find one quickly. I was quoted on June 7, 2009 under Expert Opinions with my online dating tips. 1. Online dating is a cost-effective way to meet new people. 2. It’s important to be authentic. 3. Don’t lie about your age, weight or height, and use real pictures. 4. Keep profile comments short and specific. 5. Your initial contact should be fun and flirty, and should refer to something particular you like about that person. 6. Find the time to actually date?don’t spend all your time on the computer. 7. There are lots of niche sites, so there’s really something for everyone. ?Julie Spira, Cyber-Dating Expert and author, The Perils of Cyber-Dating: Confessions of a Hopeful Romantic Looking for Love Online.